I've tweaked the general purpose card deck page.When you select a card it automatically goes on top of all the others. Hopefully this is a more natural behaviour and will make the page easier to use. You can now have up to 200 cards in a deck. My latest distractions from proper miniature gaming. 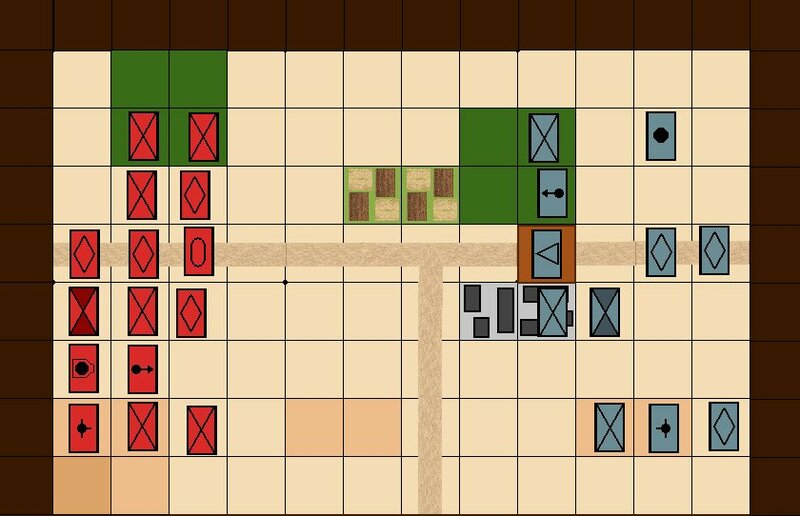 This was inspired by games played by Bob Cordery using card based unit activation such as this one and by the Command & Colors and Manoeuvre games. 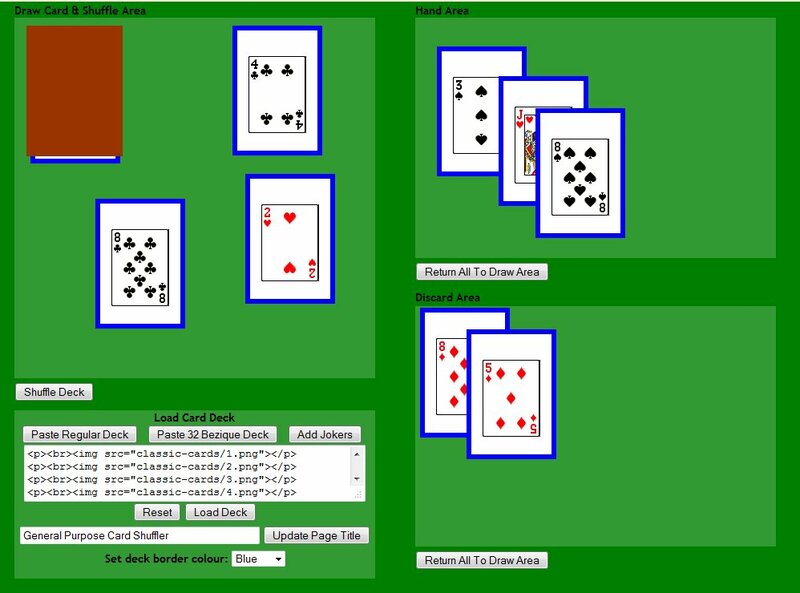 The idea is that you can list a set of cards in a text file, paste them into the box on the page, then generate a deck of cards. The cards can be dragged around the screen. You can double-click on a card to raise it put it on top of others. Please see the instructions on the web page for further details. I've tested the page in Firefox and Internet Explorer. You can just have a line of plain text for each card, or you can have HTML, with bold and underlined bits, paragraphs and links to images. There are some simple example cards in the instructions on the card page. I found some nice free playing card images, so added buttons to fill the deck of cards box with a standard deck or a Bezique deck. You can alter the page title and change the border colour of the cards. I call it C20th, this is really the 'army men' page, with two sides of generic units moulded in green and blue plastic. 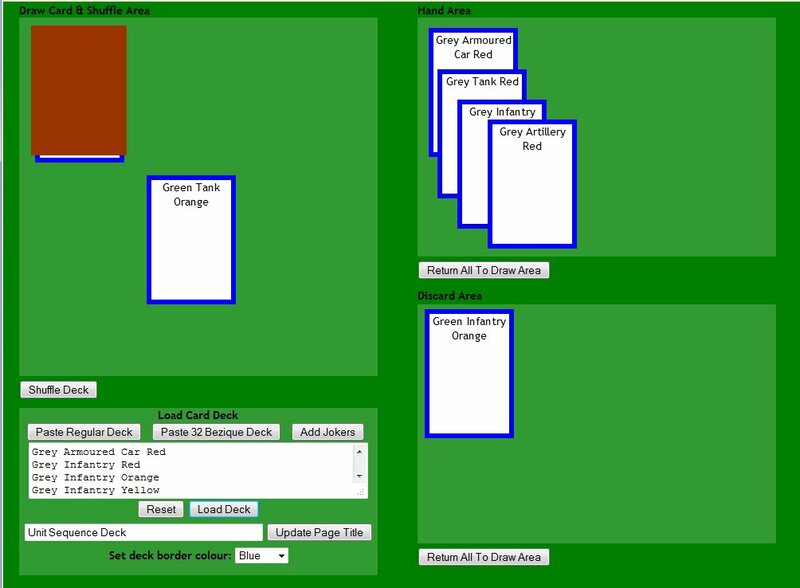 Double clicking on a unit makes a control image appear that can be used to change its facing or edit its label. Units have a coloured border that can be used with the card deck page for card activated turn sequences for specific units e.g. there will be a card for 'Green Tank Red'. 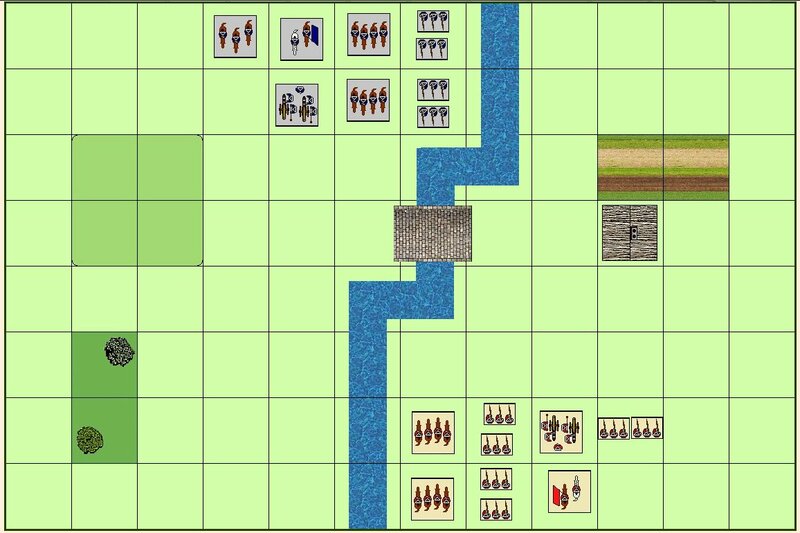 There is a stack of orange markers to indicate which units have had their move, for a card activation sequence that indicates only which side moves, rather than which individual unit. If I'm using the 'which side' only activation method then my card deck would be consist of lines just reading 'GREEN' or 'GREY', one per unit on each side. There are some fiddly little muzzle flash markers to indicate which artillery units have fired. The black smoke markers can be used to indicate hits in the simultaneous artillery exchange phase. By quick recycling of existing bits I've done up some C20th boards with block style units. There's a choice of background colour, green or light brown . The big 12 by 16 board is to allow for playing games using the Table Top Battles rules. I think horse & musket and ancient style blocks might be next. 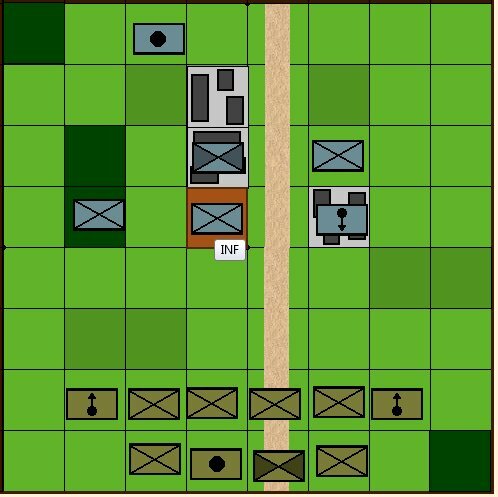 The boards use a control thingy image to change facing, double click to make it appear. 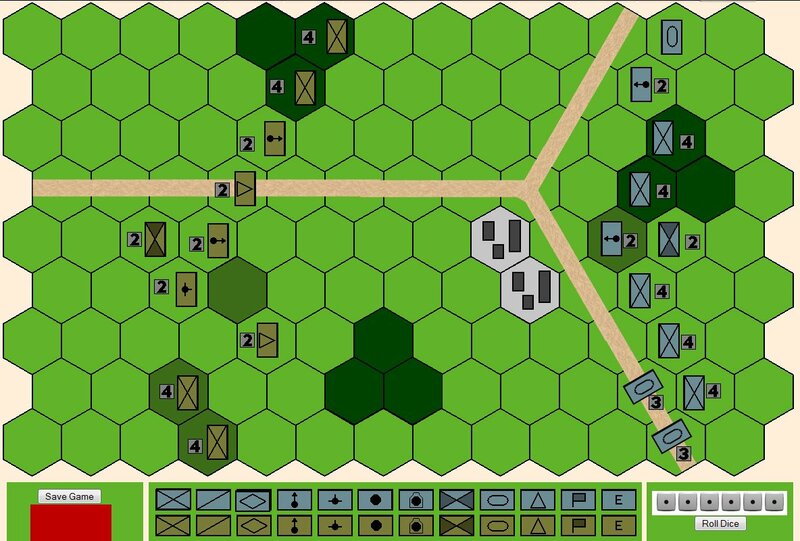 Inspired by David Crook's blog and his many excellent Portable Wargame battle reports my latest web page is for a hex based game using block style units. 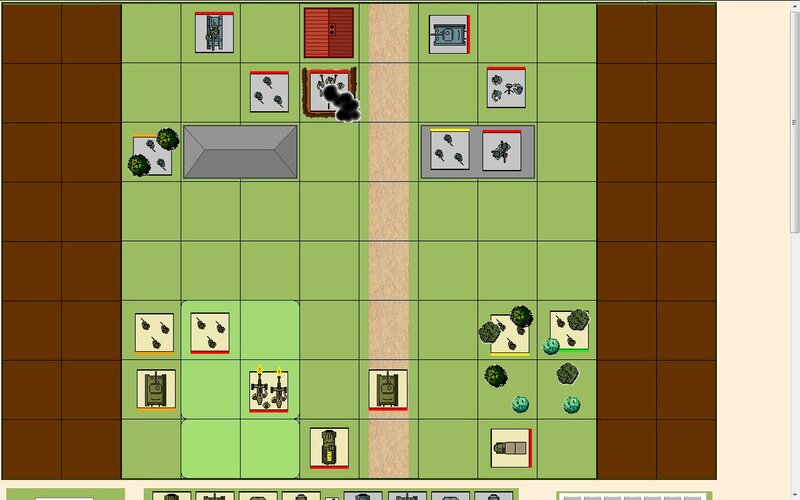 The controls work in the same way as the pre-dreadnought game; double click on a unit to summon the control-thingy that allows you to change facing or edit the unit's label. You can keep track of a unit's strength either by using the markers, which count down on a double-click, as in the screen shot,or by label editing. I'd just like to say "welcome aboard"